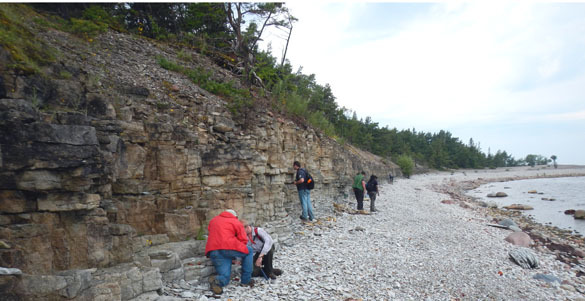 KURESSAARE, ESTONIA–Bill Ausich (Ohio State University) and I have a grant from the National Geographic Society to study the “origination and evolution of Middle Paleozoic crinoids on the Baltica paleocontinent“. Bill is the prime mover behind this project as one of the world’s experts on crinoids, and probably the expert on Silurian crinoids. My job is to help with the paleoecology and stratigraphic context for these crinoids. We have one paper in press now on Estonian crinoids with our colleague Olev Vinn of the University of Tartu. The above photo shows our team this morning looking for crinoids in the Ninase Member of the Jaani Formation at the Undva Cliff on the northwestern tip of Saaremaa Island (N 58.51679°, E 021.91727°). The full team includes Wooster students Jonah Novek and Richa Ekka (introduced before), Ohio State University graduate students Mark Peter and Alyssa Bancroft, and OSU undergraduate Jeff Thompson. Along with finding crinoids, the Wooster students will also be developing their Independent Study field projects. This is why our work is also supported by the Wengerd Fund at The College of Wooster. Today we met Olev Vinn (and his wife Ingrid and two delightful children, Sigrid and Erik) and explored three outcrops looking for crinoids, especially their elusive calices (essentially their heads). Above is a calyx of Eucalyptocrinites showing partition plates. We found many more such beauties, especially at Undva Cliff. Rain is going to be a fact of field life in the next week at least. The weather can apparently change rapidly on the Baltic coast. The above storm appeared to the west of us in mid-morning at Undva Cliff. Since the wind was blowing to the west, it didn’t seem an issue. The wind direction changed 180°, though, and quickly brought the deluge upon us. We ran back to our vehicles but were completely soaked. Lesson learned! Our second outcrop was the Ninase Member again on the western shore of Tagalaht Bay at a place called Kuriku Cliff (N 58.50282, E 022.01284). You can see us above scattered along the cliff face. 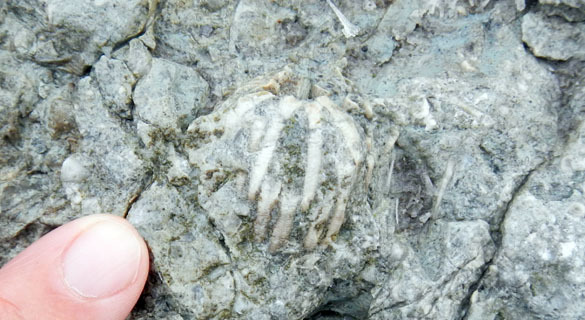 The preservation of the fossils at Kuriku Cliff is mixed. Some calcitic forms are exquisite, especially brachiopods and crinoids. Others, like the favositid coral above, are recrystallized. 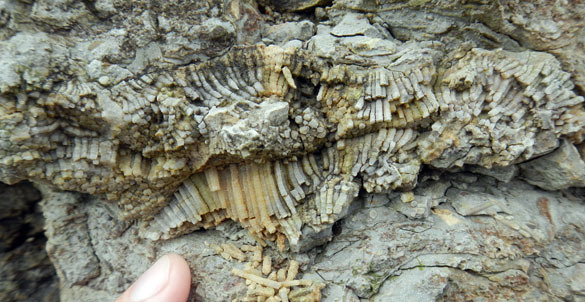 In this case the corallites filled with calcite and then dissolved, leaving an odd kind of internal mold. Our last outcrop was Kogula Quarry (N 58.28589°, E 022.26053°), where road gravel is made by progressively crushing limestones from the Silurian (Ludlow) Paadla Formation. Saturday was a good time to visit this quarry because it was closed and not operating. We found many fossils here, especially mollusks. The crinoids, though, were only rare bits and pieces. Except for that morning drenching, it was a very good paleontological day. 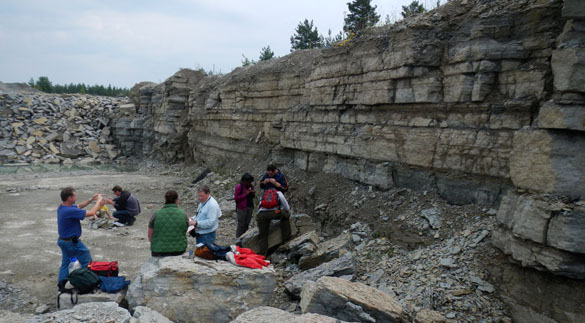 The Wooster students have been well introduced to Silurian limestones in general and Saaremaa stratigraphy in particular. Tomorrow we will see what Olev says is the only outcrop on Saaremaa I have not visited. That will complete our tour and we can then begin to do our detailed work. Now we know to run for cover as soon as we feel the wind quickly change! This looks fantastic!!!! I look forward towards hearing more about your adventures. Many of these places look familiar! Brings back great memories! best of luck I.S. students. Good to hear from you, Andy! You were the pioneering student in Estonia.